Ah…another incredible children’s book about trains. They seem to just keep on coming, which is fine with me. This one again dates back to the 1950’s. I remember it well. This is the wonderful story of how the engineer’s cap came into existence. Mr. Puffer Bill tried many different types of hats that were supposed to keep his head and ears warm, but none worked until he stitched up his own creation that became commonplace engineer attire all over the world. This story is very well-illustrated and the pictures bring back memories from my childhood. 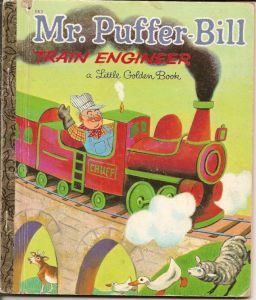 Golden Books has always done such a fine job with trains. I wonder if they need any help? Would sure love to have a copy of that book. My 29 yr old son enjoyed it. Any response? hi there im a 39 year old man and can just about remember this book from when i was very very young,i loved it so much.my grandad used to read it to me and for some reason i loved his red bandana ha ha,think i might try and buy a copy to take me back to my childhood…. My mother wrote this book and would be so pleased to read your comments and how much you enjoyed her book. She also wrote “The Whistle-Bell Train” and a non-train children’s book called “Gordon and the Glockenspiel” under her maiden name Lee Ryland, both published by Whitman Publishing. Thank you so so much for taking the time to reply,it must make you proud that your mother wrote these books and brough joy to so many little uns (now old uns ha ha) and even after all these years people are still talking about and reading them ie this site.I wish my Grandad was alive so i could tell him that you have replied to my comment (the wonders of the internet eh),once again thank you…Paul..!! Ha…thanks, Paul. I’m 42 and remember my grandfather reading it to me also. It’s one of the greats! Janis – We are honored and would love to hear more about your memories of your mother and her writings!